Even though it’s just a long row of buildings that all look the same, everybody’s satellite dish pointing the same direction, there’s something beautiful when the sun comes out after a lot of clouds, especially when it’s windy and the smoke goes away. When the sun isn’t out, there are no shadows and everything looks flat like a postcard, but when it’s shining, it’s like TV, more real. It’s better when it’s out, you feel more like you’re alive instead of all gray and inside all the time. Inside isn’t bad all the time, just when the sun isn’t shining, it can be bad. That one building, the one right in front, always looks best. There’s a lot of mold growing in the cracks and along the edges of the tiles and it looks like the building’s been crying, the way it grows down like a green, still waterfall. It’s pretty when the sun hits it. Sometimes the women hang their laundry on top and it looks like dancing ghosts having fun and you can stare at them a long time. It’s hard when all you have to do is sit and watch things, but on the good days, when the sun is out, it isn’t as hard. Some people have balconies they sit on and look out at the parts of the town they can see, but you don’t see a lot of people out there during the day, only usually at night, although sometimes you can see somebody come out and look around and maybe smoke or drink something; they never stay very long but they should, especially when the sun shines and it’s so beautiful. People should stay longer in the sunshine. The best part is when the crazy birds, the little ones, come darting and weaving close to the window. They want to see in as much as a person wants to see out! Well, maybe not, but they always come so close and they seem to be having so much fun. Maybe it’s just they like to fly so much and the buildings are the best place they can do it, or maybe they’re the only place. It’s hard to know for sure. One time not too long ago a person came out on the top of the building across from this one and everybody got all excited, you could see them trying to get her to come back but she wouldn’t, she kept standing on that ledge so they brought up a doctor—well, it was probably a doctor, though he looked different from the ones who come here—and he talked to her to come down but she wouldn’t and she kept standing out there the whole night. You could tell everyone was all worried what she would do but she probably didn’t want to do anything but be left alone. The next day she was gone and everybody forgot about her, or at least stopped talking about her. It’s a good thing she didn’t fall, though, because then, when you looked out at the buildings, especially when the sun is shining, you might remember and get sad, and there’s already enough to be sad about. Leslie Hale Roberts is a resident of Northeastern California, married and living with his soul mate, a father, writer, musician, disabled athlete and outdoorsman. His work is concerned with the observation and understanding of people in conflict with themselves and their realities. Crazy Birds is from Leslie’s unpublished collection of experimental and traditional short stories, Voices from a City of Gold: Stories from Oroville. In Oroville, Leslie writes, “California’s grasp at culture is naked, and vivid.” Stories from Voices from a City of Gold have been published in Cruffler.com, Outrider Press 2001 Anthology, Oasis, Arte Publico Press, and Brazzil. 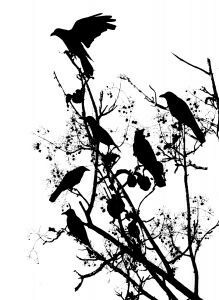 Photo "Silhouette of Crows" courtesy of Krayker, India.